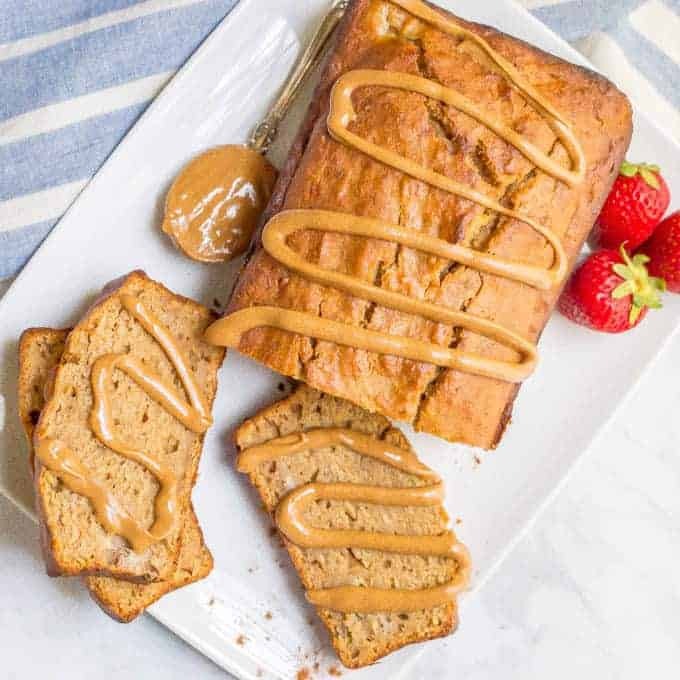 Whole wheat peanut butter banana bread that’s naturally sweetened and loaded with peanut butter flavor! Great for breakfast or snacking! Now that’s it’s September, it feels like we are all settled into back to school, even though I’m still trying to wrap my head around that. It’s one of my favorite seasons, but it is always a little hard to say goodbye to summer. So while I break out the baking pans and cinnamon and apples and pumpkin, I’m also gonna be hitting up the pool and the farmer’s market for the last of the summer goodness! Speaking of back to school, our mornings have been going surprisingly smoothly. There are moments of course, but overall we seem to be back in the groove. And I think having the kids’ breakfasts prepped ahead has made a big difference! For the longest time they always wanted our whole wheat cinnamon raisin bread for breakfast. And they love that bread with a spread of peanut butter on top. Then M decided she didn’t like raisins anymore. So she would pick out all the raisins. From the cinnamon raisin bread. 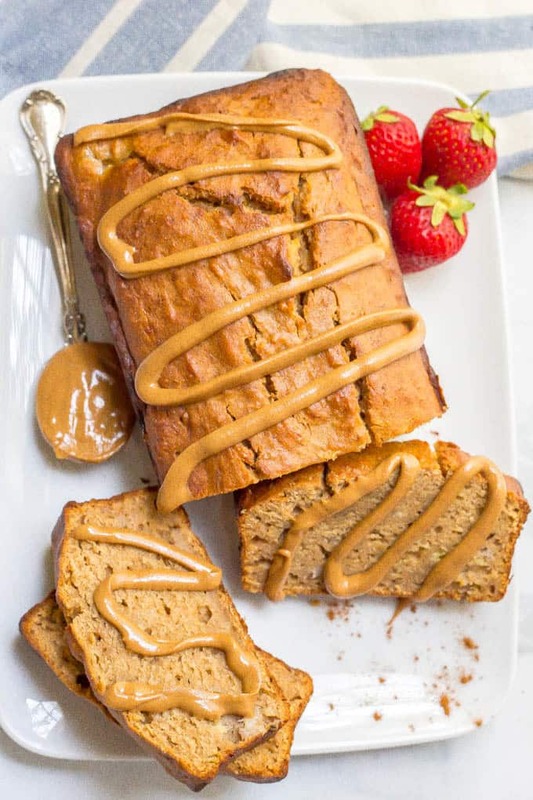 That seemed a little silly to me after a while so I came up with this whole wheat peanut butter banana bread. And oh wow, she LOVES it! So does J. They easily go through half of a loaf in a morning. So every other week, I’m making this bread again. Time to double up I think and do two batches at once cause it freezes so well! But as you may remember, ripe bananas are hard to come by in our house. 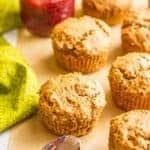 Because we eat so many bananas and also use them for banana bread baked oatmeal, banana blueberry muffins, banana chocolate chip snack cake and of course, their beloved spinach banana mini muffins. Problems, people. Serious problems here. 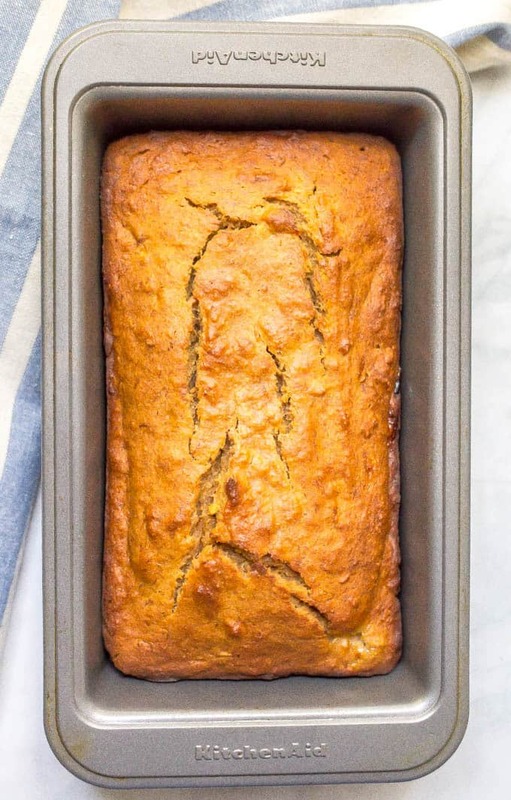 The last time I needed to make this peanut butter banana bread to have for Sunday morning, and I hadn’t hidden any bananas in the pantry to save up, I had to make some substitutions. 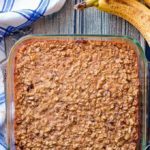 Good news – it turned out perfectly even without the bananas, so you can absolutely make this anytime! 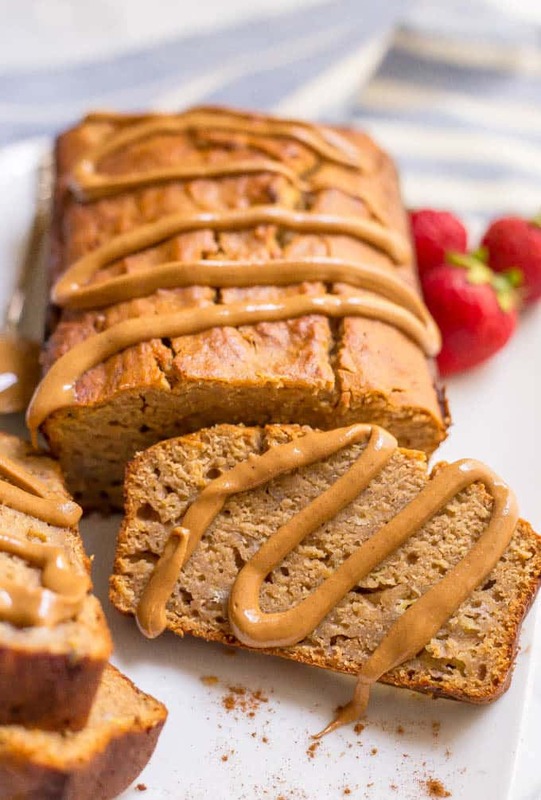 Also, this bread is whole wheat, naturally sweetened and loaded with peanut butter flavor. I know it must be, even though I rarely get to have any myself, because my kids haven’t even thought to ask for me to serve it with a spread of peanut butter on top. You can substitute regular all-purpose flour if you’d prefer. 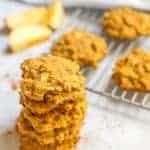 You could also substitute almond or cashew butter if you want this to be peanut free. Add some chocolate! Fold in 1/2 to 3/4 cup of semisweet chocolate chips. Mine is perfectly done at 50 minutes. However, all ovens are different so check yours at 45 minutes using a toothpick to check. This bread keeps great! You can keep it at room temperature for 2-3 days, in the fridge for another few days or freeze half of the loaf for up to 5 months. I wrap mine in aluminum foil, label it and pop it in the freezer. No bananas? You can still make this bread! As mentioned above, you can use 1 full cup of applesauce (instead of the bananas and applesauce listed in the recipe) and maybe a little extra honey to make up for the sweetness. 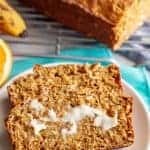 And next time I need a change up, I may try this apple oatmeal breakfast bread or cinnamon crumb breakfast bread – they look delicious! 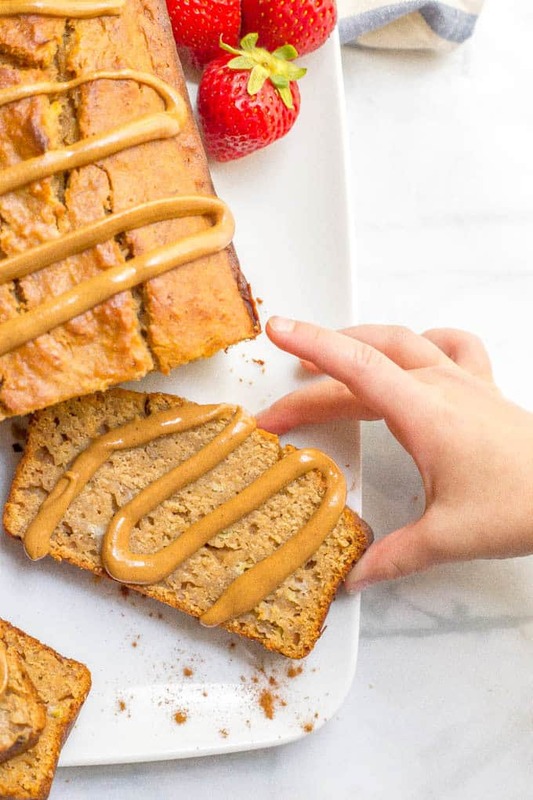 I hope you’ve had a smooth transition back to school and that you try out this whole wheat peanut butter banana bread for an easy, delicious, healthy breakfast or snack! 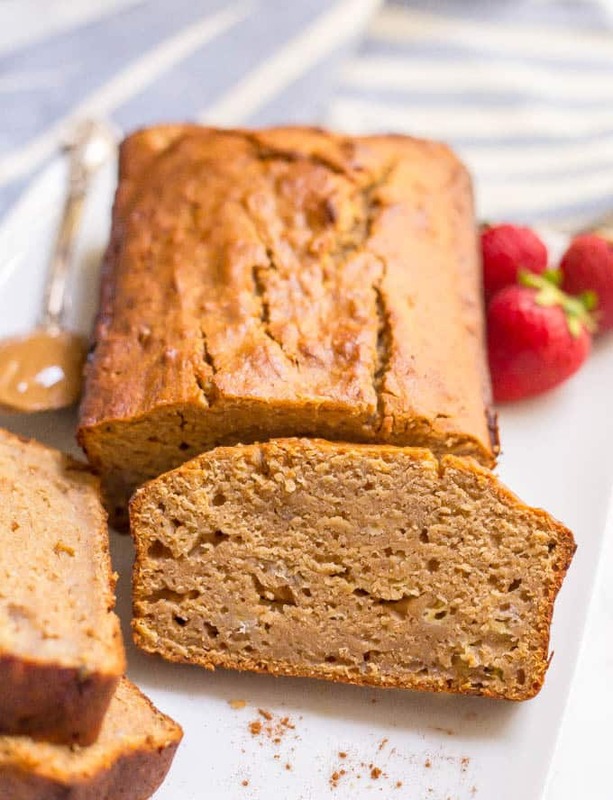 Whole wheat peanut butter banana bread is great for breakfast or snacking! Preheat the oven to 350. Spray a 9x5 bread pan with cooking spray and set aside. In a separate large bowl, mash the bananas and add remaining ingredients. Mix well. Add dry ingredients to the bowl with the wet ingredients and stir until combined. Bake at 350 for 45-55 minutes, until a toothpick inserted in the middle comes out clean. Let cool in the pan for 10 minutes then turn out onto a wire rack and cool completely. 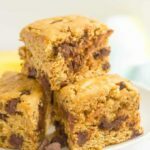 You can fold in 1/2 to 3/4 cup of semisweet chocolate chips if you want a peanut butter chocolate chip bread! Mine is perfectly done at 50 minutes. However, all ovens are different so check yours at 45 minutes using a toothpick and see. You can store this bread at room temperature for 2-3 days, in the fridge for another few days or freeze half of the loaf for up to 5 months. No bananas? You can still make this bread! Use 1 full cup of unsweetened applesauce (instead of the bananas and applesauce listed in the recipe) and add a little extra honey. How did I not think of this? 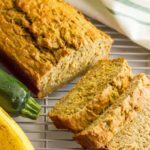 I almost always top banana bread with nut butter, but never thought to make it part of the recipe! Sounds awesome! Um, okay, I’m obsessed. This looks absolutely DELSIH! Borderline addicting, but definitely delish. Love this healthier take on a delicious classic! Looks tasty! Thanks Tara! And we did love both of them!